It was Sunday, August 21, deep in the woods near the Travis house at a place called Cabin Pond. Around a crackling fire Turner’s confederates feasted on roast pig and apple brandy. With them were two new recruits—Jack, one of Hark’s cronies, and Will, a powerful man who intended to gain his freedom or die in the attempt. Around midafternoon Turner himself made a dramatic appearance, and in the glare of pine-knot torches they finally made their plans. They would rise that night and “kill all the white people.” It was a propitious time to begin, because many whites of the militia were away at a camp meeting. The revolt would be so swift and so terrible that the whites would be too panic-stricken to fight back. 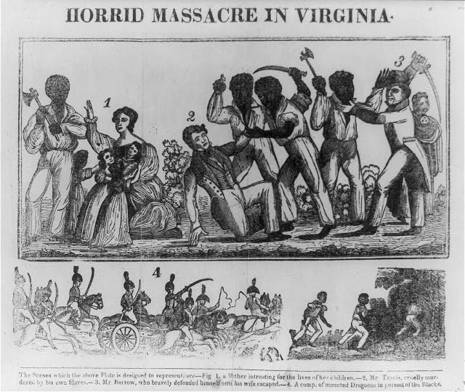 Nat Turner's Rebellion (also known as the Southampton Insurrection) was a slave rebellion that took place in Southampton County, Virginia during August 1831. Led by Nat Turner, rebel slaves killed at least 55 white people, the highest number of fatalities caused by slave uprisings in the South. The rebellion was put down within a few days, but Turner survived in hiding for several months afterward. In the aftermath, there was widespread fear, and white militias organized in retaliation against slaves. The state executed 56 slaves accused of being part of the rebellion. In the frenzy, many innocent enslaved people were punished. At least 100 blacks, and possibly up to 200, were killed by militias and mobs. Across the South, state legislators passed new laws prohibiting education of slaves and free blacks, restricting rights of assembly and other civil rights for free blacks (such as prohibiting formerly allowed voting), and requiring white ministers to be present at black worship services.